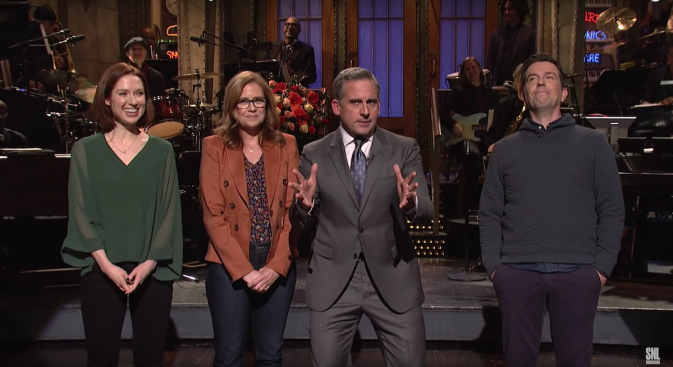 "Saturday Night Live" host Steve Carell is joined by his former costars from "The Office". On this weeks episode of "Saturday Night Live," the show opened with a parody of Fox News' show "The Ingraham Angle", hosted by Laura Ingraham. Kate McKinnon played a baffled Ingraham, and made up hilarious excuses as to why the Democrats retook the House of Representatives during the midterm elections. Cecily Strong appeared as fervent Fox News host Jeanine Pirro. In the monologue, host Steve Carell started by talking about his new film "Beautiful Boy." The speech was quickly hijacked by audience members who all asked him to consider reprising his role as boss Michael Scott on the hit show "The Office." After resisting, Carell was confronted by his former costars from the show, Ellie Kemper, Ed Helms, Jenna Fischer and his wife, Nancy Carell. Carell played Jeff Bezos in a skit that showed the Amazon CEO explaining his reasoning for opening headquarters in New York and Virginia. Carell's Bezos hints that it had less to do with business and more to do with showing President Donald Trump who's boss. Colin Jost further mocked Amazon's new headquarters on "Weekend Update," taking time to call out New Yorkers that oppose Amazon's plans, saying "only New Yorkers could complain about getting 25,000 new jobs." Michael Che calls out the voting process, and questions how Floridian voting machines overheated after a vote recount. English singer Ella Mai was the musical guest, performing her hit single "Trip." Mai released the song shortly before she released her self-titled album last month, which has received critical acclaim.